Dr. Anna Stammler-Gossmann (Arctic Centre, Finland). 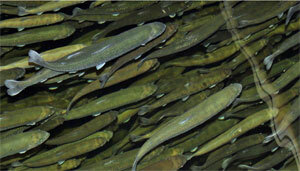 Lecture: ‘Domesticated’ fish: what is behind our salmon steak? Documentary film ‘Notes about the sea: Composition on blue and red’. (Marine environment and pollution in Gulf of Mexico), 50 min, language: Spanish with English subtitles. Introductory lecture: Life in extreme environment: Antarctic Ocean and risks on board. This entry was posted in All, Announcements. Bookmark the permalink.